Ox-Bow's studios are open 24 hours daily. Situated at the edge of the Tallmadge Woods overlooking the Ox-Bow lagoon, the studios include a painting and drawing studio, an open air metal sculpture studio, a ceramics studio, an open air glassblowing facility, and a paper/book studio and a works on papers studios, both are also used for multiple non-traditional courses. Descriptions of each studio can be found below. In 1975, the Haas Painting Studio was built with contributions from board members, Cissy and Albert Haas. It is a spacious north lit painting and drawing studio with plenty of wall space, tables and easels. In 2007 it was renovated and winterized in order to become six 10' X 10' studios for our fall residents, and a classroom for our winter program. Our first glassblowing classes were held under a tent with instructor Jerry Catania’s equipment and tools in 1985. 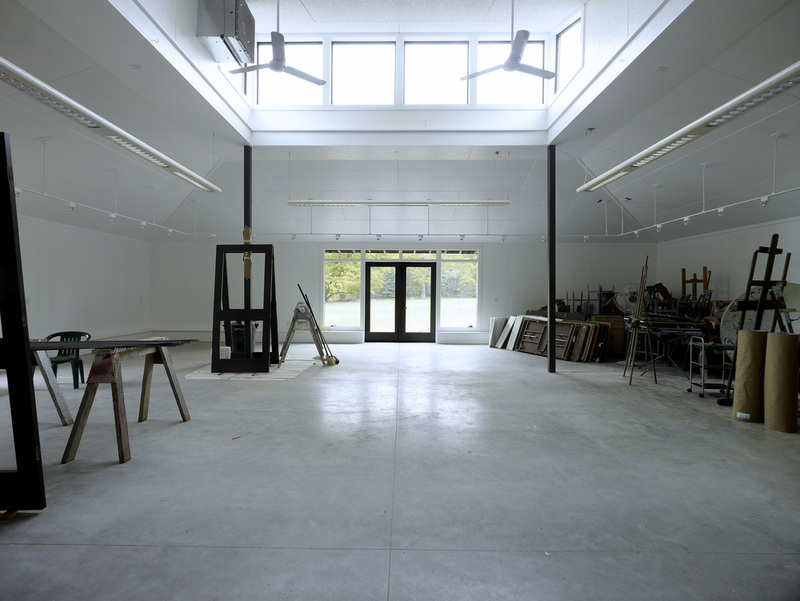 The Burke Glass studio was constructed in 1988 thanks to donations from Helen “Dilly” Keeler Burke and Grinnell Burke. An addition was put on in 1995 and completed in 2000. The glass studio is an open air glassblowing facility with three glory holes and a glass annex for glass bead making and cast glasswork. The Walter Marshall Clute Memorial Studio and Gallery was built in honor of Ox-Bow’s co-founder who passed away in 1915. This studio is now used for papermaking, artist book and sculpture courses. Our open-air metal and sculpture studio was a gift from Seymour and Esther Padnos. The studio has hosted blacksmithing courses, iron pours, jewelry making, and woodworking courses. Ox-Bow's ceramics studio was built in 2000 to honor Albert Krehbiel, who was influential in the early development of Ox-Bow. The ceramics studio has several electric kilns, a gas-fired car kiln, sawdust and raku capabilities, as well as a wood kiln, which was built in 2005. New in 2009, the Works on Paper Studio was built to house printmaking, sculpture, photo, video and other courses. The original print studio was built in 1967 with funds from Ursula Randall and named after instructor George Buehr. The new Works on Paper Studio is built at another site and is a two floor facility. The bottom floor houses the print studio; complete with lithography, collograph, etching, screenprinting, and woodcut facilities, as well as letterpress. In the past, the top floor has been used for classes involving digital media, performance, embroidery, history and science. This group studio house, built in 2006 and named after former instructor Dan Lutz, is a winterized studio used for fellowship student studios in the summer, artists in residence during the fall and a classroom during the winter program. Community bicycles that are available for those staying on campus are located nearby. The Bogart dates back to 1873 when the Ox-Bow Inn was frequented by fisherman. It has been used by School of the Art Institute of Chicago alumni in the 20s and was also a women’s dormitory known as “the Convent.” It was later the residence of Alice Bogart, who left it to Ox-Bow after she passed away in 1984. “The Bogart” is now used as studios for Ox-Bow staff and fellowship students. In 1953, a studio building was built and given the name “the Convent” after what was originally “the Convent” is renamed “the Bogart.” In 2007, this studio was renovated for use in the fall and received a new ceiling made of wood from the demolished print studio. Its four 10'X11' studios are used by independent study students and artists in residence. As much as Ox-Bow is a community and an experience, it is also a really engaging and specific site to create in. With 115-acres and over 22 historic buildings, artists in residence are invited to interact, install, and investigate the physical landscape. Artists, however, are not allowed to make any permanent changes to the landscape and are not allowed to use materials in the landscape that are not easily removed (ie concrete, paint). Everyone is responsible for siting their projects with Ox-Bow’s residential staff and for removing all evidence of installation upon completion of their course or residency.